Windows FAT NTFS partition data recovery software retrieve accidentally deleted FAT16, FAT32 files restore inaccessible NTFS, NTFS5 formatted folders. This software is read only and non destructive. Data restoration tool recover not detected pictures, movies, images, mp3 songs, audio, video files. Software support files retrieval on windows XP, 2K, 2K3, ME, NT, 98 operating system having SCSI, IDE, EIDE, ATA, SATA hard disk drive. Utility restore corrupted Microsoft Office files like MS Word doc, Excel xls, Access mdb and Power Point ppt. 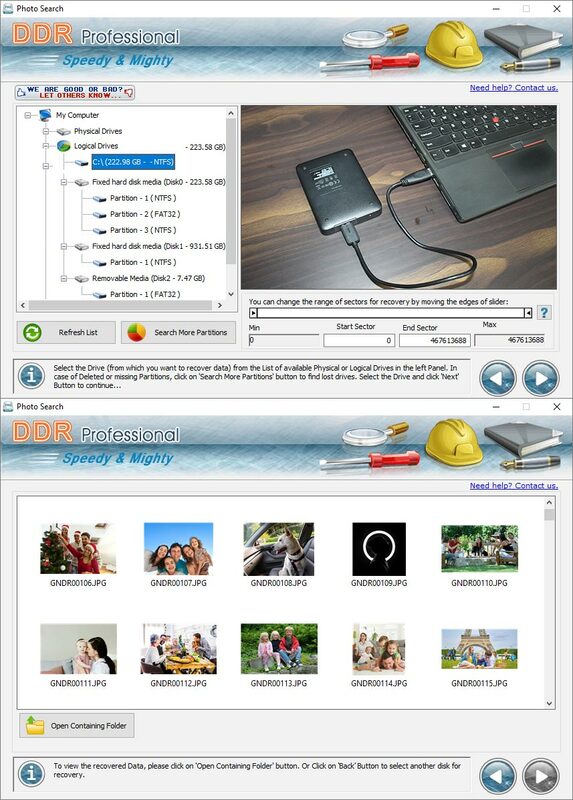 Tool also support recovery of audio files like mp3, mp4, rm video files like MPEG, MOV, MPG, MIDI, AVI, DAT and pictures files like JPEG JPG PNG GIF BMP RIFF TIFF PSD. Software rescue damaged and undetected files folders. Software provides restoration of corrupted root directory, MBR master boot record, DBR dos boot record, file allocation table and MFT master file table due to hardware malfunction, virus, threats, improper shutdown, system crash and power failure. * Software recover windows FAT12, FAT16, FAT32, VFAT, NTFS, NTFS5 partition deleted data. * This non destructive tool provide data recovery even if the content like files and folders have been deleted with Shift and del key. *If the recycle bin has been emptied, recovery is possible by this software. * Restoration is possible even if the disk volume has been reformatted. * This is read only tool provide retrieval quickly and easily. * Utility support multi storage hard disk drive like SCSI, IDE, EIDE, PAN, SATA. * Software recovers damaged, corrupted and formatted data due to virus infection, hardware malfunction and improper shutdown. * Bad sectors can be recovered from hard disk. * Software restores encrypted and compressed data files or folders. * Provides restoration of root directory, file allocation table, master file table, master boot record, dos boot record.